Victoria’s new road safety strategy will be a decade-long plan aimed at reducing deaths and serious injuries by more than 30%. According to Deputy Premier and Minister for Police and Emergency Services Peter Ryan, meeting this target will bring the annual road toll to less than 200, which means saving about 80 lives a year. The new 10-year strategy involved views from the community – almost 17,000 Victorians – plus evidence and input from road safety experts and partner agencies including Victoria Police, the Transport Accident Commission (TAC), the Department of Justice and VicRoads. Everybody – drivers, passengers, pedestrians and cyclists – has a responsibility to make the right choices because it’s those choices that will help us reduce the number of deaths and serious injuries on our roads. Measures outlined in the strategy include not only new penalties and enforcements but also education campaigns and engineering measures aimed at reducing road trauma. Some of the major measures in the strategy include a new alcohol interlock device law targeting convicted drink drivers and tougher penalties for individuals driving under the influence of alcohol and illicit drugs. The new road safety strategy also addresses speeding and driver distractions as two additional contributing factors to road trauma. Speeding and inappropriate speeds contribute to almost a third of all Victorian road deaths. To tackle speeding and driver distractions, the strategy proposes the use of vehicle safety technology to help drivers to comply with speed limits and the introduction of “initiatives that reduce the risks associated with distraction and inattention”. Alongside this will be the implementation of simpler speed limits, increased enforcement of speed limits, and better education on improving people’s understanding of the risks of distraction. A comprehensive US study showed that 80% of crashes and 65% of near-crashes involved driver inattention in the few seconds before the onset of the crash or near-crash. Other than that, the Victorian government will also increase the availability of vehicle safety features in the Victorian car market and encourage the uptake of these features. Drivers, especially new and young drivers, are encouraged to purchase cars with higher standard safety features. While many new cars, such as those by Volvo and BMW already include some safety features such as speed limiting technologies, there are no safety technologies so far individuals who want the safety features without having to buy a new car or pay a premium price. Road safety technologies such as the Mobileye C2-270 Advanced Driver Awareness System is an excellent option for these safety concerned road users. It’s the only comprehensive aftermarket advanced driver awareness system that can be installed onto almost all types of vehicles. 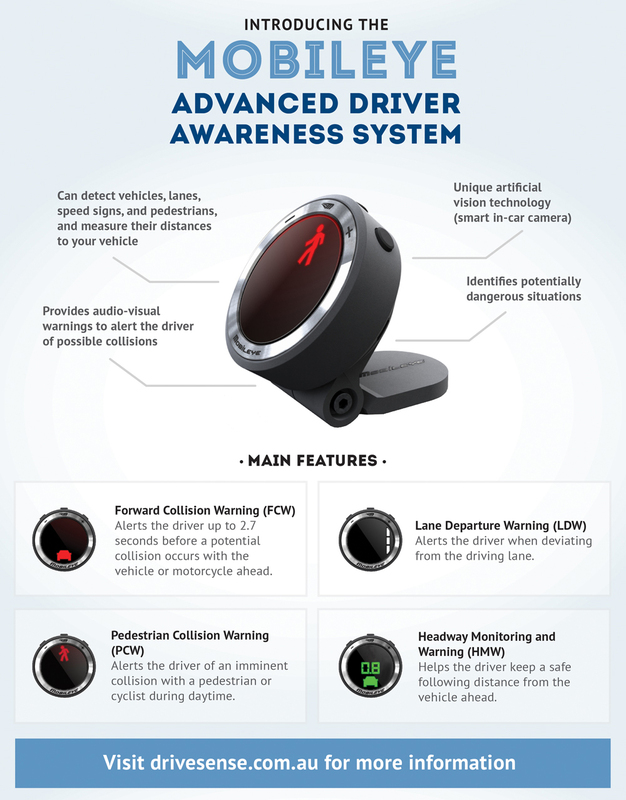 With comprehensive safety features including headway monitoring and warning, lane departure warning, forward collision warning, pedestrian collision warning (with cyclist detection) and speed limit indication, the Mobileye system provides real-time alerts to the driver up to 2.7 seconds before a potential collision, giving the driver sufficient time to avoid a collision. Introducing road safety technologies such as the Mobileye will not only reduce the risk of collisions on the road but also help to shape better drivers. It’s suitable for all drivers, young and old, and can be customised to user preferences. The key to safety is awareness on the road and understanding that it is our responsibility to make the right choices and be better road users, whether we are pedestrians, cyclists, drivers, or passengers. Taking the initiative to include road safety technologies into your car is one big step towards acknowledging our responsibility as a road user to maintain road safety. Mobileye C2-270 is available for aftermarket purchase and installation for $1450. Learn more about the Mobileye or buy the Mobileye online. For reseller or distribution opportunities, please visit the Andatech partner page.